For everyone who read about that study in the news and walked out of the restroom with wet hands, take note: wet hands pick up more bacteria than dry hands. Not only is it downright inconvenient to grab the restroom doorknob with wet hands, it’s like you never really washed them at all for touching the doorknob everyone else has been touching too. After you’ve followed the CDC’s recommendations on proper hand-washing protocol, you need to follow through completely by drying off with a paper towel. Now that science has discovered the ugly truth about air-blowing hand dryers in the restroom, let’s talk about logistics. Air-blowers simply take longer to dry hands (aside from the fact that they’re spewing toilet plume back on your hands). Paper towels get the job done significantly faster, actually removing more bacteria through the friction it takes to rub the water off of your hands. Love everything about you guys. Never trying to upsell or short on an order. Genuine company that puts the customers need first. Rate to see these days. The average person can transport up to 200 million bacteria on their hands after a visit to the restroom. Without washing and drying, they can then actually leave behind a trail of this bacteria on an average of about 16 different objects. So, you have to be smart about paper towel usage. Before washing your hands, elbow the paper towel dispenser (or use one of the no-touch dispensers where you just wave your hand in front) and get a paper towel ready for you to use directly after rinsing the soap off your hands. After toweling off, use this paper towel to open the restroom door and then discard in the trash. That way, you avoid picking up restroom door handle bacteria on your way out. One last thing: This latest study about air-blowing hand dryers being such nasty bacteria throwers has been hard for many to grasp for environmental reasons. Air-powered hand dryers were supposed to help reduce trash going into the system. 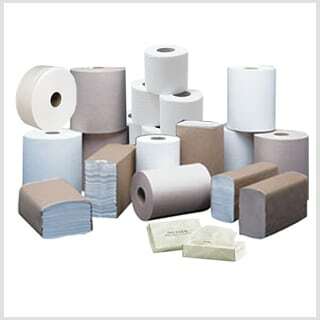 The good news for workplaces throughout Northern Virginia is that Loyal Hygiene provides top-notch restroom paper service using environmentally sound paper products made of recycled, biodegradable materials. The researchers who discovered the problem with the air-blowing hand dryers have now replaced those germ-spewers with paper towel dispensers in all 36 restrooms featured in the study. You can too! Just contact Loyal Hygiene today at 703.361.7888 and help keep your workplace clean and your employees, clients and visitors healthy.